In October we awarded our first Respects Your Freedom (RYF) certification to the LulzBot AO-100 3D Printer sold by Aleph Objects, Inc. 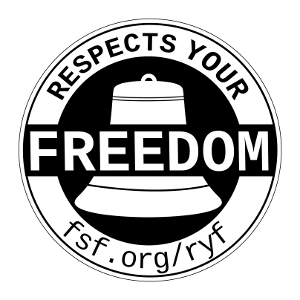 The RYF certification mark means that the product meets the FSF's standards in regard to users' freedom, control over the software that runs on the product, and privacy. The free software community and the public have been very supportive of and excited about the RYF certification program, and are eager to see more computer devices ship with RYF certification marks. A small number of people have asked us if we could add more requirements to the RYF certification process, specifically, whether or not we can certify that the hardware itself -- not just the software that ships on the device -- can be considered free hardware. While following-up with free hardware advocates, I found very cool and growing nascent communities. They ranged from individuals building analog devices to those trying to fab their own chips. But, the one thing I found in common with almost all of these communities was their commitment to free software. So while we don't currently have plans to expand our certification to include more free hardware requirements, I did in the process learn a fair bit about free hardware design. There are many aspects to designing hardware, including mechanical drawings, schematics, PCB layout data, HDL source code, and integrated circuit layout data. And there is also a fair amount of free software for doing electronic design automation and simulation, including Fritzing, KiCad, Qucs, and XCircuit. Another thing I learned while researching and talking to people in the free hardware community is just how important it is for developers to be creating more free formats and low-level free software. It really is a high priority! And in fact, some projects can be found on the FSF High Priority Projects (HPP) list. In terms of free formats, we have the replacement for OpenDWG libraries on our HPP list. OpenDWG is a collection of CAD files, a specification for CAD format, and proprietary software tools for creating and manipulating CAD files. If you want to help replace OpenDWG with a free format and free software tools, considered helping LibreDWG. But, perhaps the biggest bottleneck right now that is preventing more hardware products from being able to have RYF certification is the fact that hardware makers are shipping proprietary software for their Graphics Processing Units (GPUs). In many cases, this is because they are selling functionality -- that is they will sell different proprietary software that is that is able to unlock different graphics functionality on the same hardware. If you want more GPUs that respect your freedom, I urge you to help a GPU reverse engineering project.